Ultra-low-maintenance and a compact installation footprint were the key factors in Data Power Dear’s decision to specify Vantage nickel-based batteries for passenger station UPS systems that support critical control and safety functions for Metro de Caracas. Oskarshamn, Sweden, February 9, 2015 – Alcad has delivered contracts worth around Euro 2.5 million for Data Power Dear, the UPS specialist, to design, manufacture and supply 34 trackside battery systems installed at passenger stations on Metro de Caracas, the mass rapid transit system serving Venezuela’s capital city. 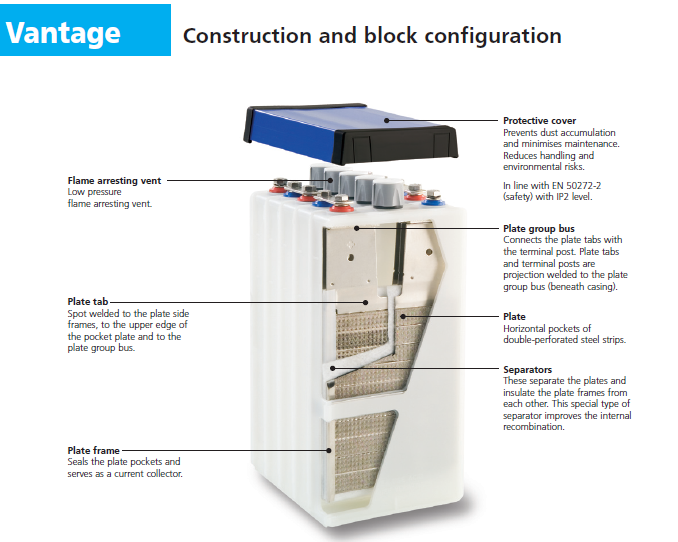 The battery systems, comprising nearly 3,400 Alcad Vantage ultra-low-maintenance nickel-based batteries, now provide reliable standby power for the UPS systems supporting critical control and safety services for an integrated transport system serving a population of 4.5 million people. The Metro de Caracas comprises: a subway network; the Metro Los Teques suburban railway; Cabletren Bolivariano – an automated people mover (APM) running on viaducts with two-way cable propulsion; the MetroCable Mariche – a gondola lift system serving the mountainous region of the city. Alcad provided the 34 Vantage battery systems to Data Power Dear, the supplier of the main totally redundant industrial uninterruptable power system (UPS) for Metro de Caracas, including rectifiers, inverters/static switches, external by-pass, DC/DC chopper and distribution units. In the event of a loss of power from the main generators, the Vantage battery systems provide 90 minutes of reliable autonomous operation for the main automation systems, train controls, fire detection systems, telecommunications and emergency lighting. “Metro de Caracas is an application where safety and reliability of every factor is paramount. We needed to have total confidence in the reliability and performance of the batteries over a long service life. Alcad’s Vantage batteries with their leading-edge technology, compact design and exceptional track record were therefore the perfect fit”, said Eng. Antonio Cipoyone, General Manager Data Power Dear. Data Power Dear’s critical requirement was to achieve total reliability and optimized Total Cost of Ownership (TCO). The Vantage nickel‐based battery chemistry offers an exceptionally long and predictable service‐life of up to 20 years, with no risk of ‘sudden‐death’ failure. Under normal operation, the Vantage cells are completely maintenance‐free, with no requirement for routine topping‐up with water. A particular challenge was that in some locations Metro de Caracas didn’t appear to have enough space to locate an Industrial UPS (in some cases two redundant UPS) and their associated battery bank. Thanks to the compact Vantage design, which offers high power and energy capacity within a small installation footprint, Data Power Dear was able to overcome these space restrictions to create a solution with the required performance and capacity. Delivered in 2014, Alcad Vantage batteries are now installed and commissioned on the Metro de Caracas.